Considering the media buzz surrounding the rising emergent markets, one might think that the American economy is doomed to be overtaken by new players in the market. The future belongs to the BRICs – that acronym has been given to the four highest performers in these markets, Brazil, Russia, India and China. Many claim that these four countries will outperform the U.S. in economic growth and wealth over the next decade and become future world economic superpowers. Not so fast. There can be no doubt that each of these countries has improved upon their per capita income substantially, but that is not the whole story. Many factors account for their great past growth. However, this does not mean they can repeat the performance in the future. 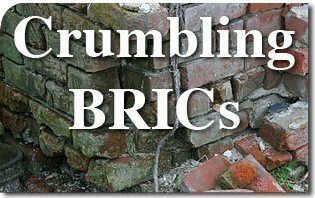 One major factor in the BRICs success story is the fact that they opened their stock markets to foreigners starting in the mid-eighties. It was then that Wall Street started tracking them as a distinct asset class referred to as emerging market countries. In 1987 foreign investors created a huge boom by increasing their investment in emerging market stocks by 600 percent. Money invested jumped from less than 1 percent to almost 8 percent of the total global market in 1994. By 2002, the stock markets in the developing countries lost nearly half of their value and were reduced to four percent of the global total. Developing countries’ share of the global GDP fell from 23 percent to 20 percent between 1987 and 2002 with the only exception being China, which saw its share double to 4.5 percent. The question to be answered in all of these exceptional cases of economic growth has always been can a country sustain these periods of growth for two decades or more given that the average business cycle is five years. When an emerging market country has a per capita income of $5,000 and under, it is also much easier to demonstrate growth from the lowest tier of income particularly when one reads stats that refer to percentage gains not a dollar equivalent. Japan, for example, was hailed as the economic paradigm during the eighties and as its economic growth continued, analysts predicted that it would surpass the U.S. economy in a few decades. Economic forecasters employed straight-line projections of economic trends, demonstrating that Japan would soon overtake the U.S. Only later was it clear that these were unrealistic predictions. This too applies to China, hailed by many as the future economic powerhouse. Straight-line projections do not reflect reality since China’s economy has slowed sharply from double-digit annual growth to less than seven percent forecast for the coming year. The population in China is simply too large and aging too quickly for its economy to achieve the economic growth that it dreams of. With over 50 percent of its population living in cities, China is nearing what economists call “the Lewis turning point.” This is the point where a country’s excess labor from rural areas has been almost completely depleted. This has been caused by heavy migration to cities over the last 20 years and a diminishing work force created by the immoral one-child policy. China does not show any serious signs of maintaining its economic growth and certainly is not the paradigm the U.S. should follow. In light of this, it is puzzling to hear Obama appointed Jobs Czar, General Electric’s CEO Jeffery Immelt state in an interview with Charlie Rose on CBS that “state run communism may not be your cup of tea, but their government works.”1 If by “works” you mean destroying the country’s economic engine by limiting family size, using slave and child labor, maintaining one of the worst human rights records in the world, stealing technology from the West, selling inferior products created with ineptitude and greed and bullying neighboring nations, then perhaps it does; but not by any civilized standards. In the final analysis, it will not be from nations like this that our society will be restored. This entry was posted in News Commentary and tagged America, billion, Brazil, BRIC, China, crumbling, debt, dollars, economy, India, million, Order, return, Russia, thousand, Wall Street by Gary Isbell. Bookmark the permalink.